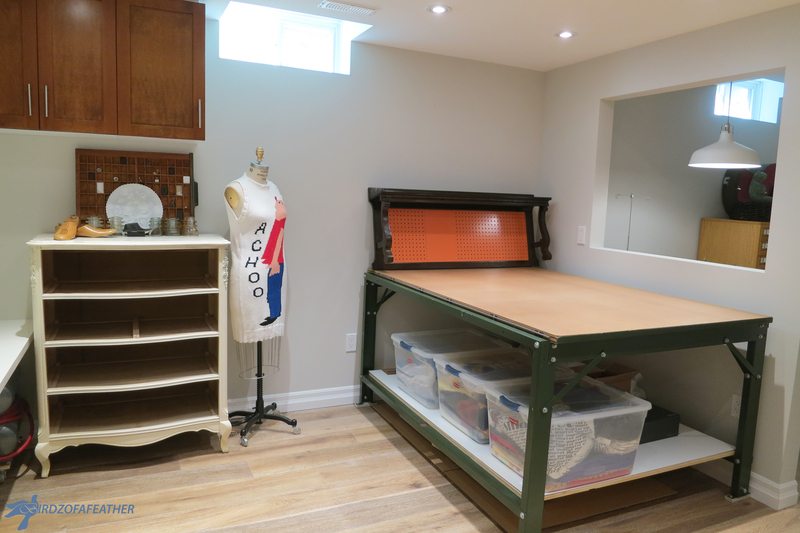 Today marks the launch of my new craft category Birdz of a Feather ~ Craft Rehab so what better way to kick it off than to organize a craft room?! We’ll still post DIY home & garden reno projects too so be sure to follow us if you don’t want to miss a post! Since finishing off my craft studio at the end of last year, I’m spending more time on craft projects. To kick off my new focus for 2017, (and celebrate my new craft studio) I thought I would dedicate this first post to craft room organization. There’s a ton of room to store both my hanging and tissue patterns, my glass grinder, my tools and even my thread (although I changed my mind about the tread as you’ll see further on). The clear glass drawer fronts allow me to see everything I have in an instant! There’s a flat storage space for my self-healing cutting mats and all of my tools are stored on pull out shelves so they are readily accessible. It’s impossible to loose anything when you can simply pull out a drawer to see what you have! The only trick to keeping it organized is making sure to return everything back to where I got it; so far it’s worked like a charm. Instead of hiding my cone threads and yarns in the cabinet, I decided to relocate them to display them in all their glorious colour. The vintage glass oak display cabinet keeps the dust off everything. The 6-drawer card catalogue resting on top of the cabinet adds additional closed storage. I organized things like tape and fasteners in the drawers. To organize my collection of vintage irons and other cast iron objects, I’ve displayed them on an Ikea Lack shelf. I love being reminded of how far technology has come in the last century. I couldn’t believe it when we found the shabby chic highboy shown below on the side of the road. It was missing its drawers, but it turned out to be perfect to tuck away larger project components so I can clear my work table when I have things in progress and need to move on to another step. It’s so easy to store and grab things from the open shelf space. My grandmother bought me the industrial pattern table to christen my first studio. Hubs added a shelf onto the bottom of it so I could store some closed bins that are holding my fabrics. My grandmother (and Mom) taught me most of what I know about crafting and I always think of her when I’m looking for some inspiration for my next project! My favourite piece (if I had to pick just one) is the kitchen drawer units we repurposed from our kitchen renovation. We faced the front of each drawer with MDF to get a clean slate. I blew up a picture of a VW beetle that hubs restored and attached it to the MDF for a unique storage piece. There are six large and deep storage drawers as well as a vertical pullout (similar to the pull-out cabinet we built for our new kitchen). I store most of my finished projects in the drawers that are still waiting for their final place in our home (or someone else’s home!). On the other side of the divide, we installed a perforated metal backer. I can hang some items on the metal, either peg-board style or by magnets. I haven’t organized this spot yet, but will likely store my rulers here. My work area will one day hold a laptop or desktop computer so I can design and execute in the same space. Above the floating desk, we installed additional wall cabinets to maximize storage space. Now that everything is coming together organization-wise, I can fully concentrate on the fun aspects of my new craft studio: creating and making things! Here is a sneak peak of my very first craft project in 2017. I’ll be showing you how to make your very own blue jean planter. Isn’t it adorable? I’ll have a full tutorial, and hopefully a video for you, very soon! UPDATE Aug 2017: Here’s some links to a few things I’ve since made in my new craft studio! Do you realize how talented you are! Love your organization! And your crafts!